My rides along Amtrak California’s Capitol Corridor now include an eerie stretch where they pass the site at which the highest ground motions in the Napa earthquake were recorded mere weeks ago. Just at the south abutments of the I-80 bridges over the Carquinez Strait, where the Union Pacific tracks pass through the C&H refinery, a shallow borehole seismometer recorded an acceleration of 0.99g, nearly the full force of gravity lurching soil and structures from south to north. The extreme magnitude of this acceleration is a local anomaly, with the next highest recorded accelerations being ~0.66g in downtown Napa, where heavy damage was concentrated. We know that in between these official seismic stations, accelerations exceeded 1g where, for example, sidewalk slabs were overthrown. The formal strong motion records are accessible through a web database maintained by the USGS and the California Geological Survey: the Center for Engineering Strong Motion Data. Indeed many significant new structures throughout the Bay Area (notably, large residential towers on Rincon Hill and the new eastern span of the Bay Bridge) got their first recorded response to significant ground motion during this 6.0 quake. These data allow engineers to calibrate and validate their models of structural response in order to verify how their seismic designs work, or to identify potentially compromised structures quickly following an earthquake. 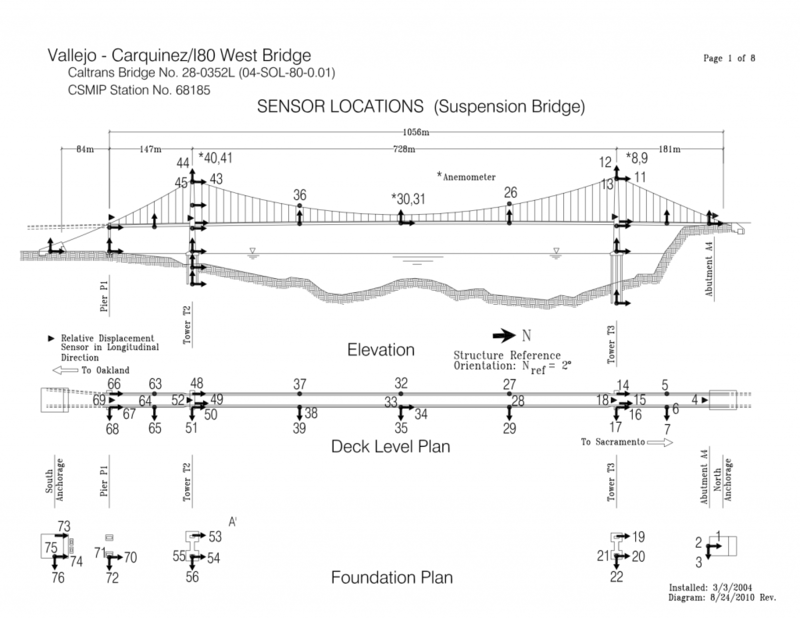 The Carquinez Strait site of highest recorded ground motions, above which Amtrak whizzes 36 times a day–and so do over 100,000 cars, offers a perfect illustration of seismic design and structural response. In addition to borehole seismometers on the south shore capturing the “ground truth” of shaking at the site, both the eastbound and westbound interstate highway bridges soaring above are heavily instrumented to gauge structural response to ground-shaking. Notably, the westbound interstate lanes cross a brand new suspension bridge, completed in 2003 to replace a 1929 steel truss structure whose 1958 twin still carries the eastbound lanes. The differences among the accelerometer records from the ground, the 56-year-old metal truss bridge, and the 10-year-old suspension bridge are illuminating, and apparent even to a non-expert. The site is 19 km from the epicenter. On the ground, the quake here was sharp, impulsive, and relatively short. The P-wave is strong, and the S wave follows by just over two seconds, yanking the instruments northward. High amplitude shaking lasts around 5 seconds then trails off. On the metal truss bridge (accelerogram below), this motion is channeled into a dominant frequency as the bridge resonates. Here on the bridge, perceptible shaking lasts two to three times as long as it does on the ground below. There’s still a lot of ragged, high-frequency motion apparent at all positions along the bridge because the rattly metal structure’s small, stiff components transmit that original high-frequency energy from the ground. Amplitudes are consistently higher at the tops of the towers (channels 8, 23) and at midspan (channel 34) than they are on the piers and abutments (channels 6, 13, 32). For a really fascinating detailed look at how the structure responded, match the channels labeled here with this diagram of the instruments on the bridge. The suspension bridge is a whole different beast. Shaking starts strongly and abruptly with the P-wave, and by the time the S-wave ripples through (top two records, channels 54 and 74, show stations on bridge elements mounted firmly in the ground, and thus closely resemble the “ground truth” shaking), the bridge is already beginning to oscillate. Here, the structural resonance is strong and profoundly apparent… and it lasts for at least 40 seconds. Two dominant frequencies appear (more may be evident with more quantitative analysis than this cursory visual inspection), but you can see especially in the displacement records (e.g., channel 35 displacement) the main 1 Hz signal as well as another ~0.2 Hz (5 seconds per cycle) that shows up toward the end. You would feel this as strong, rhythmic bouncing for quite some time. Spooky!